We have 2 days here on Bora Bora, after a day at sea traveling from the Cook Islands back to the Society Islands of French Polynesia, shown here. Bora Bora is surrounded by a large reef, enclosing the island and a beautiful lagoon. Notice there is only one place that a ship can enter the lagoon. We are anchored just off Vaitape, and take a tender to the town. These kids were have a great time getting their outrigger canoes into the wake of the tender and getting a free ride. They were here because there was a festival going on in town. One of the activities was a canoe race. Aren't these kids just adorable in their native costumes? Just down the street there was fresh fish for sale. I didn't get a shot of the kids waving palm fronds to keep the flies away. The hibiscus here are about 4 times bigger than they are in the US. Think you don't know any French Polynesian words? You do! Tattooing started right here. I enjoyed the wrapping of the sign posts with palm fronds. And the simple huts that some of the natives live in. Wait a minute - is that a satellite dish? I thought these huts over the water were only at a certain hotel, but all the hotels are done like this. On the map of Bora Bora, you may have noticed that there are cannons at various spots around the island. The US put them here during World War II. Oh goody - rusty stuff! And some of the many desserts after dinner. After dinner there is dancing to the music of Siglo, the ship's band. Believe it or not, they have been on the ship for 12 years! They must have started when they were 6 or 7! 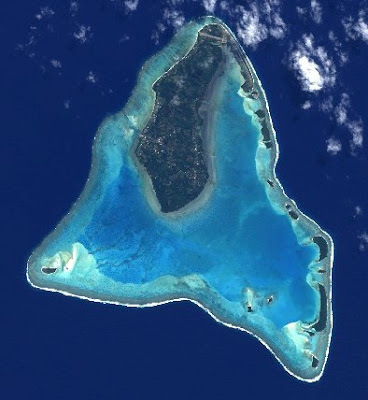 Roratonga is the largest, most mountainous, and most populated of the Cook Islands. The lagoon is much smaller than Aitutaki's, and not the best for snorkeling. The water is rather rough where the ship anchors, and about half the time the shore excursions are cancelled. But we lucked out, and off to town we went. We immediately happened to meet Sal, who offered us a 20-mile trip around the island for $10 each. Wow, what a bargain, when the shore excursions through the ship are about $100 each. She was a real character, and we had a great time. And one at the beach at Muri Lagoon, one of the few spots where you can snorkle. 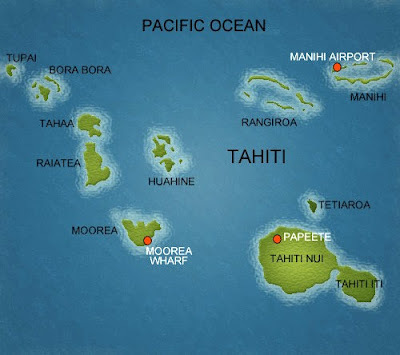 The Cook Islanders have their own language, but since they are loosely associated with New Zealand, they also speak English. After our one-hour tour, we went walking through the town. The Cook Islands and French Polynesia are famous for their Black Pearls. And of course they have a lot of tropical shirts. Wandrin' Lloyd would be in heaven. And they have the usual assortment of funny t-shirts. Read this one carefully. They had the usual assortment of chickens and goats, but here there were dogs running wild. I then realized that Aitutaki did not have any dogs. They are banned there. I heard a couple different stories of why that is, both from long ago. Either they were afraid the dogs were spreading leprosy, of the daughter of a king got bitten. Walking along the waterfront, I got a shot of our ship. Back on the ship, we were treated to a demonstration of Polynesian dancing, put on by a local dance troup. Ahhhh... The end of another day in paradise. Aitutaki in the Cook Islands is a beautiful island surrounded by a blue lagoon and lots of small islands, called motus. There is only one entrance into the lagoon. The ship parks outside and the tender carefully makes its way throught the reef to take us to the island. I had arranged a tour privately on the internet with Teking (rhymes with The King). It came highly recommended and was half the cost of the shore excursions through the ship. "Kia Orana" is the greeting here in the Cooks - it means "May You Live Well." We first went by the wreck of the Alexander, a boat which used to bring supplies to the island. Teking didn't even slow down, so I had to take my picture of rusty stuff on the fly. 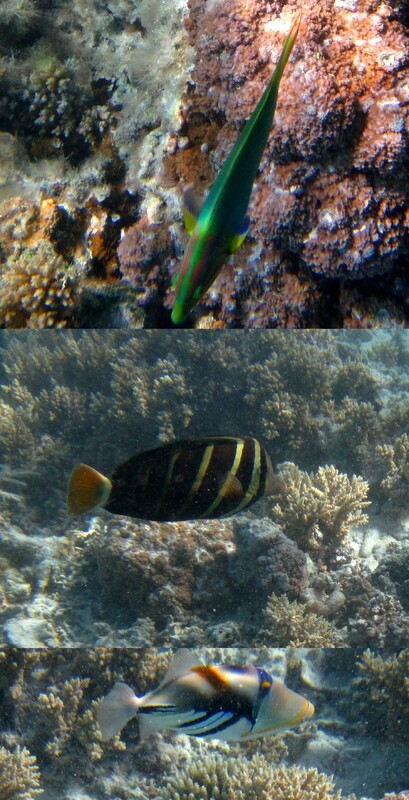 Then we got to our first snorkel stop. There were 3 boats on the tour, but we got on Teking's boat. He really puts on quite a show. And then into the water - WOW! A little bread goes a long way. Different fish everywhere you looked. I saw a Giant Moray Eel carrying a large dead fish. All the little fish eventually brought in a Giant Trevally Jack fish. Scared me half to death, but he was after the little fish. He was about 3 feet long. Remember my pretty little silver and turquoise underwater camera? Well, he liked it too and tried to eat it. Unfortunately, he got my hand instead! He had really sharp teeth. Teking wanted to take me back, but I dicided to tough it out. The next stop was at the giant clams. They are more than a foot across and about 20 years old. That was the home of the South Pacific Kiteboarding Center. Then onto another motu for lunch. A Red-Tail Tropic Bird, or Tavake, was nesting in the foliage. That red tail feather is a couple of feet long. A baby was nearby - not sure is it was the same kind of bird. Teking put on quite a spread, laid out in giant clam shells. Afterward, we had a hermit crab race. Phil's came in second. Then on to our final snorkel stop. This was where a lot of purple coral was, and I found a pretty blue starfish. Then on to another motu that was one of the small islands where Survivor-Cook Islands was filmed in 2006. How cool is that? The show was filmed on the islands in the lower right corner on the first picture. Then on to One-Foot Island, so named because a man and his son were trapped there by warriors. The man walked in his son's footprints and saved his life by hiding him. You can actually get your passport stamped here.